I took a bit of a hiatus from the Monthly MashUp, but there’s been a lot going on behind the scenes. Starting in January there will be some fun changes. 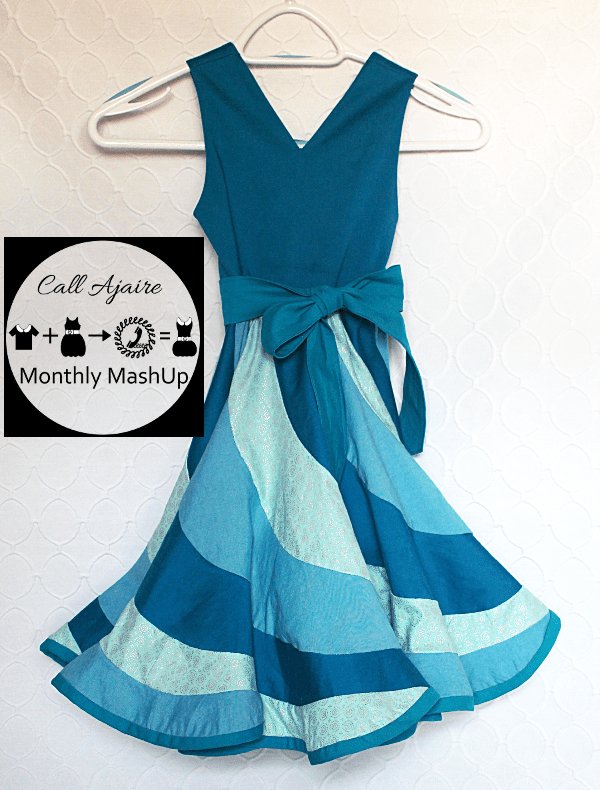 For those of you looking for the rest of the October MashUp, it’ll be coming in December, but for now we’re moving on to November’s MashUp so you can have time to make a unique holiday dress for your girl! 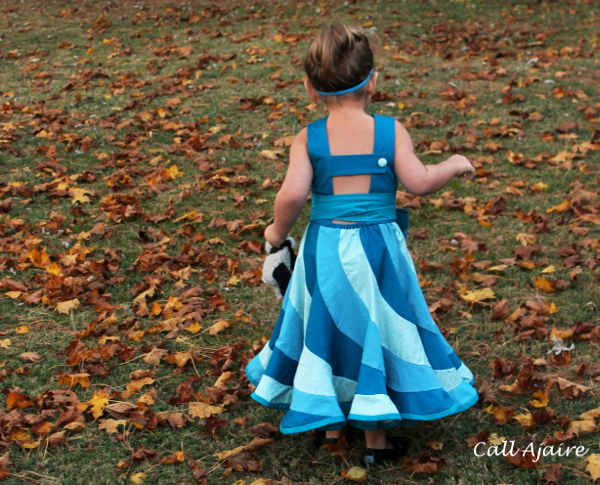 I took a fan favorite: the Peppermint Swirl Dress from Candy Castle Patterns and mashed it with MY favorite: the Saffron Twirl Dress from Paisley Roots. 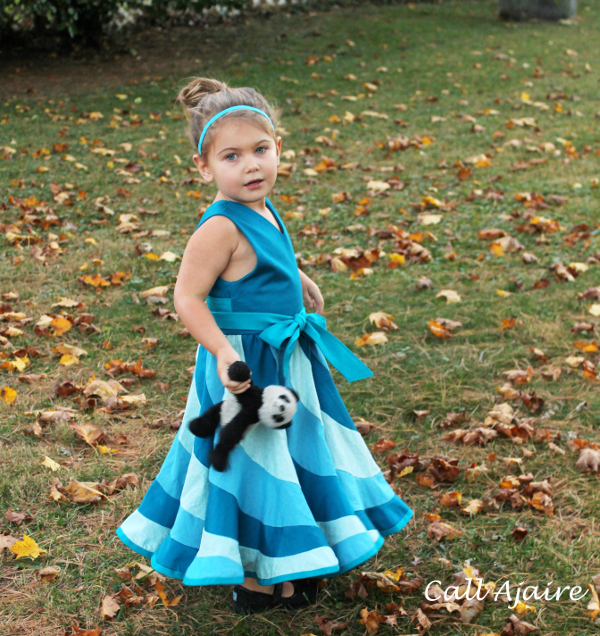 The result is a gorgeous dress that’s perfect for the holidays! Let’s talk about how great that Peppermint Swirl skirt is. It’s made up of a ton of flounces that don’t look like they’d amount to anything, but like magic the skirt comes together. It’s super full and has a lovely movement. I like that you can mix up the number of flounces and number of fabrics you use to create a unique look. The bodice of the Saffron Twirl dress is classic with a modern edge. I like the simplicity of the lines, but the v neck and open back are what really draw me in to this pattern. I chose to use the long sash ties so we could wrap them around the back and tie the bow in front, but the short ties are a favorite too. Bean calls it her Cinderella dress and refuses to take it off. She also insisted on the headband since Cinderella wears one, hehe. 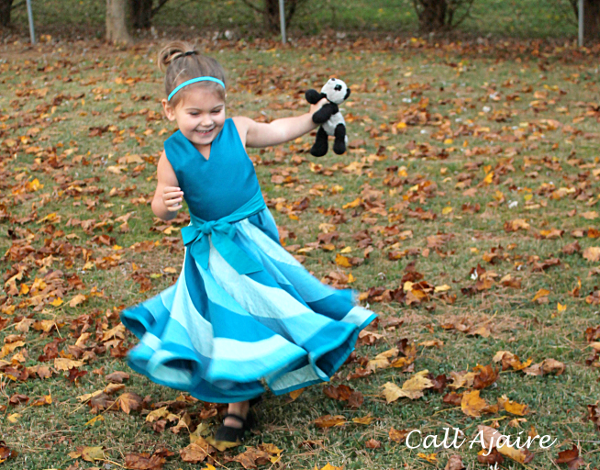 It was hard to get any pictures that weren’t blurry since she was compelled to twirl in this dress! I used a few shades of blue for the skirt and ties. The bodice fabric is a lovely stretch sateen from Imagine Gnats (*affiliate link) that I’m completely obsessed with. It’s soft and just the right amount of shiny. Sateens are a favorite of mine for making bodices. I like how sturdy they make the top of a dress that’ll hold the weight of a full skirt. 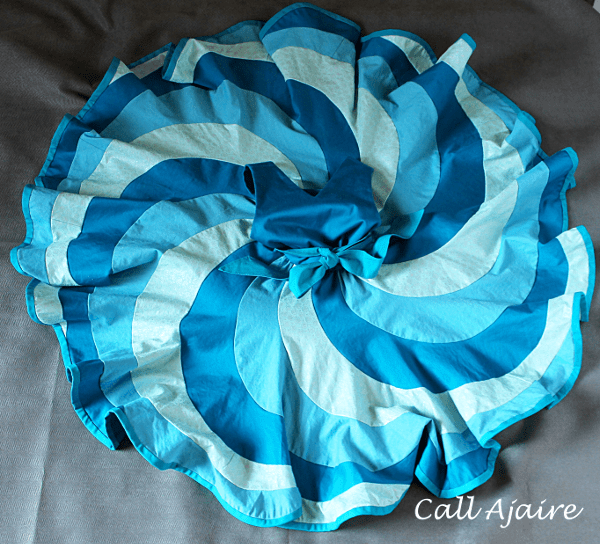 The lightest color blue is a wintery-look fabric from JoAnn Fabrics, as is the shirting fabric I used for the sash and to bind the skirt edge. 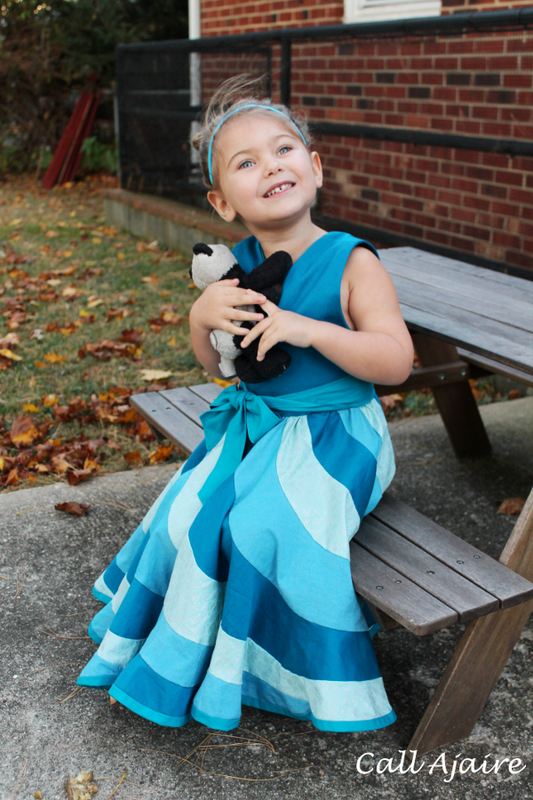 The other blue is an interlock chambray also from Imagine Gnats (*affiliate link). I’m opening up the Link Up and the Giveaway below, but I’ll do a full review of each of these fabulous patterns next week. I’ll also share the details of the mashUp so you can mash-a-long so stay tuned! Candy Castle Patterns and Paisley Roots have each generously donated a PDF pattern for the giveaway so one lucky winner can mash-a-long. If you are interested in purchasing the patterns you can do so here and here respectively. No way!!! That is amazing! I love this mash up! I bet it was a pain to press the seams. How is it finished inside? I like the binding finish, very cute. Actually, because of the way the flounces are cut and will hang, there was no need for pressing! I actually serged everything together so it went together pretty quickly considering. There's also a lot of room for not having everything lined up exactly. You can just sort of run the pieces through the machine and if they don't line up exactly they will work out anyway. It's hard to explain (though the pattern does a pretty good job) exactly why this is, but it really works out. Bias binding is my favorite edge for a circle-ish skirt. There's no real difficulty with getting the hem to lie flat when you bind it 🙂 Actually the pattern suggests it too! I love the shades of blue! I think using solids really plays up the design of the 2 dresses. Well done! Oh, so pretty! Wow wow wow!! I love everything about this dress! 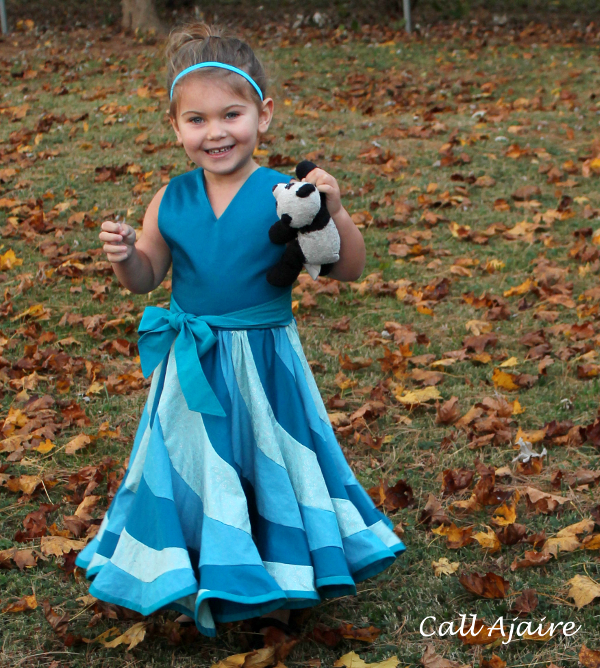 The skirt, the bodice, the color are all divine!